Coconut cocktails are among the tastiest treats in the bar and there is a great variety to choose from. You can mix up a tropical Piña Colada with your favorite rum. Maybe the brandy-based Kappa Colada or the non-alcoholic Coco Colada is a better fit for your current mood. Yet, if you're looking for a fun, new way to drink your coconut, we have a few ideas to turn up the taste of the tropics. 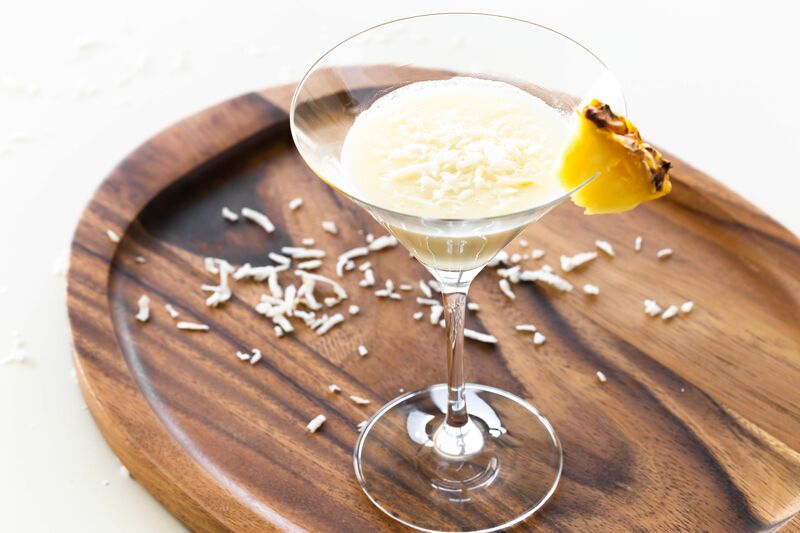 This is no ordinary Coconut Martini recipe. Inside this glass, you'll find a sort of inverted Piña Colada with just a hint of pineapple. The base is made up of vanilla vodka, coconut rum, and cream of coconut and it's a stunning little treat. Tip: Cream of coconut is the most common non-alcoholic mixer that adds the luscious flavor of coconut to mixed drinks. It's preferred because it is sweeter and thicker than coconut milk. Coco Lopez is the most popular brand and can often be found in liquor stores because it is essential to making a Piña Colada. Cream of coconut is not the same as creme de coconut, which is typically rum-based liqueur. When you're in the mood for a tropical drink without the liquor, you'll want to turn to the Coconut Key Lime Momtini. It is a fun twist on the average coconut cocktail, featuring limeade, coconut milk, and key lime juice. It's a bit like key lime pie in a glass. Tip: Coconut milk often separates in the can. You can use either the thin or thick milk for this recipe or mix the two back together for the perfect balance between the two. The Caipirinha is not the only cocktail that's a hot commodity in Brazil. The country also boasts about the sweet, refreshing taste of the Batida. This recipe also features cachaça to which coconut milk, lime juice, and passionfruit are added. Coconut and pineapple are a natural pairing for the most tropical of drinks. Those like the Blue Hawaiian and Bahama Mama rely on this matchup and they've long been favorites. When you're in the mood for a truly beachy cocktail, grab the rum and your favorite coconut liqueur. Tip: There is a great variety of coconut-flavored liqueurs available. They may also be labeled "creme de coconut." Popular brands include Bols, DeKuyper, Kalani, Koko Kanu, Mahina Coco Clement, and Marie Brizard. The creamy coconut cocktails are fantastic, but sometimes you want that same flavor in a lighter form. In this case, turn to the refreshing Coco Light Martini. The recipe is simple and uses both coconut vodka and coconut with a hint of pineapple and lime. In just a few minutes, a fabulous martini is ready to enjoy. Tip: Coconut vodka has become one of the hot new flavors and a number of brands offer it. Ciroc is the top of the line offering (and used in this recipe) while New Amsterdam is a budget-friendly favorite. There are those times when you just want to pour, mix, and drink. This is when a recipe like the Surfer on Acid comes in handy. It's beyond simple: just pour equal amounts of coconut rum, Jagermeister, and pineapple juice. It's ​a favorite bar drink and one that anyone can pull off. Tip: As with many cocktails, feel free to serve the Surfer on Acid however you like. It's fantastic on the rocks, but also makes a great party shooter or neat martini-like drink. Have you had enough of the pineapple-coconut combo? Let's turn to another very fun frozen cocktail and get a little chocolate into the mix. The Bushwacker is a great recipe that mixes up dark rum, coffee and chocolate liqueurs, cream of coconut, and milk. It's a boozy milkshake, need we say more? Skim the top layer off an unshaken can of coconut milk. The milk naturally separates into two layers and the thicker top layer is the sweeter of the two. Mix sweetened condensed milk with a small amount of coconut extract. Begin with 1/2 teaspoon and adjust to taste. Coconut should not be reserved for the sweltering days of summer. There's no reason you can't bring it into the holiday season as well. A recipe like the Holiday Spice is a little Piña Colada and a little Eggnog. You'll be surprised at how well this works and it certainly brightens up the winter season. Tip: Batida de coco is a creamy liqueur that can be used in place of the cream of coconut in drinks like this. Mangaroca is a popular brand. As countless candy bars have proven over the years, chocolate and coconut are a delicious combination. When the winter winds pick up, toss a shot of your favorite coconut rum into a steaming cup of hot chocolate and unwind after a busy day with this Mounds Bar cocktail. Tip: If you really want to dress up this drink, begin with real homemade hot chocolate. It's a more indulgent option to cocoa and all you really need is "some kind of chocolate" and milk.